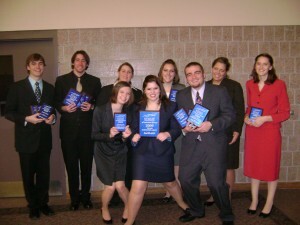 The Gustavus forensics team took second place at the 44th annual Michael Nicolai Collegiate Forensics Tournament. Gustavus finished behind Minnesota State University, Mankato in the team sweepstakes. The University of Wisconsin-Eau Claire finished third with Ripon College and the University of Wisconsin-Madison rounding out the top five. Gustavus senior C.J. Hunt took first place in the individual sweepstakes with four top five performances. Hunt placed first in the Poetry, second in Program Oral Interpretation, fourth in Duo along with sophomore Sam Hemmerich, and fifth in After Dinner Speaking. Junior Phil Helt also had a strong showing in the individual sweepstakes by placing third. Helt took second place in Prose, third in Communication Analysis, and fourth in both Informative Speaking and After Dinner Speaking. Senior Emma Moreau had a strong tournament as well with a first place finish in Prose, a third place finish in Drama, and a fourth place showing in Impromptu Speaking. Hemmerich added two individual trophies to his fourth place finish in Duo with Hunt. Hemmerich took third place in Prose and sixth place in Informative Speaking. Other top performances included senior Paula Wiggam’s fifth place finish in Drama, first year student Kate Bissen’s third place finish in Persuasion, and first year student Hannah Engel’s fifth place finish in Persuasion. The team will now take some time off to prepare for fall semester finals, but will be back in action on the weekend of Jan. 16-17 when it takes part in the Hell Froze Over Swing at the University of Texas-Austin. For more information about the Gustavus forensics team, visit the team’s website at gustavus.edu/academics/communication/forensics.